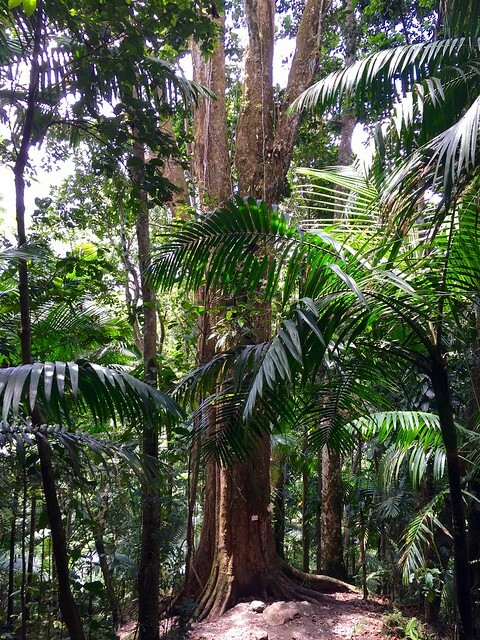 My longtime friend Jen came for a visit this week and we thought we’d show her the only tropical rain forest in the US National Forest System. It was also my first time venturing into the forest as well. 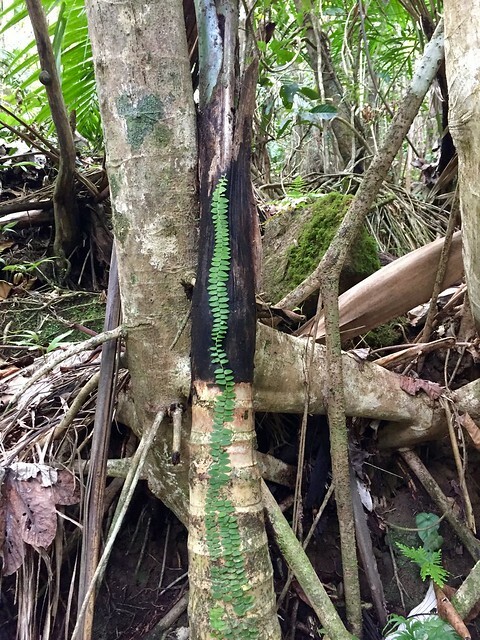 As you may or may not have known, there is a theory that El Chupacabra comes from El Yunque. Theory is that El Chupacabra was a US Government experiment that escaped it’s secret lab in El Yunque during a damaging storm in the 1990’s. Alas, we didn’t see any chupacabras this trip into the forest but I suspect it was more due to the sheer amount of people keeping it in hiding rather than its lack of existence entirely. We did find some lovely waterfalls with cool crisp pools of water to sit in. I’ll take these over El Chupacabra any day. The first trail we hike/walked was to Mina Falls. There are 2 paths you can take to enter here, the upper and lower. 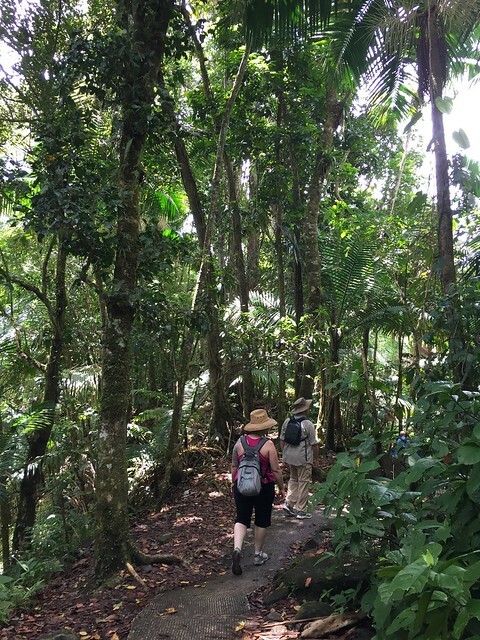 We hiked in using the lower, its a little more uphill on the way in than the upper path, but both paths are paved so its not a tough hike at all, we saw kids and older folks handling the walk/hike. There are places to stop along the way, picnic tables to sit and rest, and signage about the various trees and the type of forest you’re in. 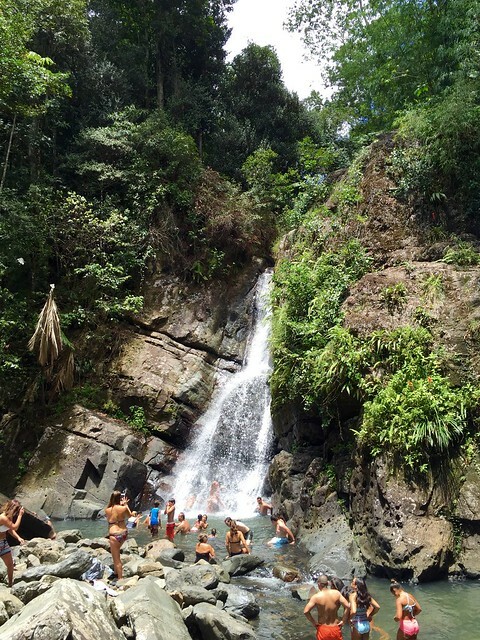 Mina Falls are probably the most famous of the falls in El Yunque so they are pretty popular on the weekends. If you want the falls to yourself (or at least not overflowing with people) I would suggest going midweek and early morning. The path one way takes about 20-30 minutes depending on your speed. When you get to the falls, you’ll see most people find a spot in the pool above the bridge. There are some steps carved into the rocks to help you in, but be careful as the rocks are still slippery. As you can see from the pics, the upper pools can turn into people soup! When we got there, there weren’t too many people in the smaller pools below the bridge. These aren’t as convenient to enter and there is some rock scrambling and balance required but nothing terrifying. We found ourselves a nice little pool below a small waterfall to cool off in. The water is crisp and refreshing. I could have sat in the pool for a week. Some other people liked our idea and soon our pool was the new popular pool to hang in so we decided that was the queue to go find some lunch. We forgot to pack a lunch but there are a few kioskos along the road before Mina Falls that sell frituras and pinchos and jugos naturales. We had a few pinchos de pollo (chicken skewers) and a bollita de papa (potato ball stuffed with chicken) and I had a jugo de tamarindo. All very tasty, and with a great view of the mountains and the island below. I’m not sure these guys are open on the weekdays during the off season so that is a plus to going on the weekend when there are more people, but next time I think we’ll pack lunch. After lunch we went looking for Juan Diego Falls. These aren’t falls that the Park Service advertises or shows on the maps. If you know a local, or have heard word of mouth you can find them. These are less of a hike and more of a short scramble but oh so peaceful. There are a couple pools almost right by the road. When we got there a family had staked out those pools with their easy-up and full BBQ set-up. Luckily there are more pools. 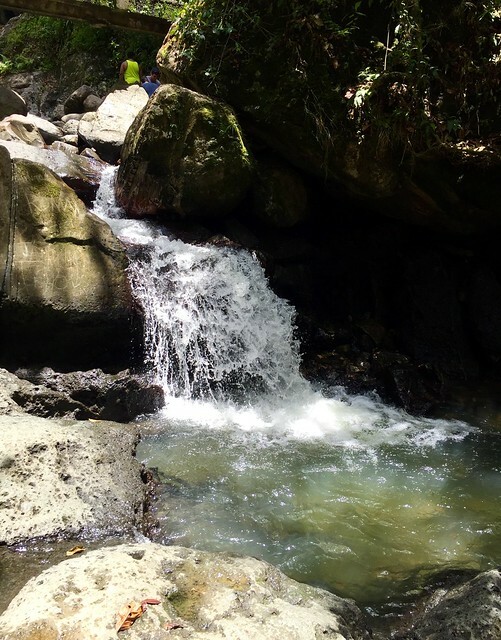 A 5 minute scramble up the path takes you to a higher pool with a roughly 20’ waterfall. We had this pool mostly to ourselves, it was so great we stayed almost 2 hours. There are little fish in the pools, we saw some arthropods, and Jen even made a tiny little lizard friend that jumped on her head and tried to come home with us. I really wish I had gotten a picture. There are a couple other pools another scramble up the mountain that some people passed us to go up and drink beers. We were content with our little pool and got to the point we were so cold we figured it was time to go home. I was cold all the way until we got home which is about an hour away! It’s hard to imagine being cold to the core when its consistently 85-90 degrees out. 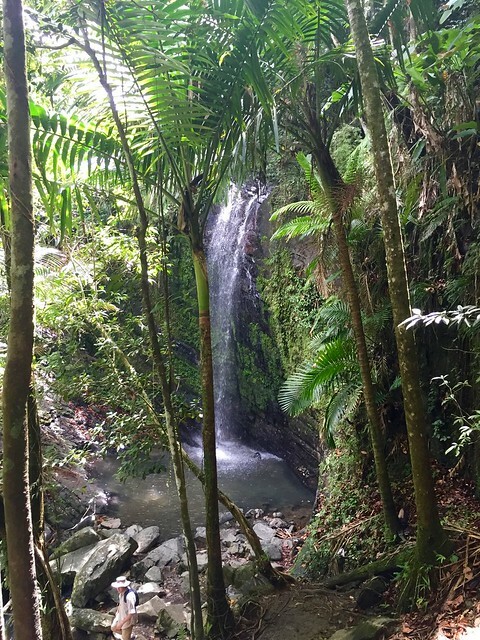 El Yunque is a wonderful feature of Puerto Rico and has amazing history to go along with its natural features. 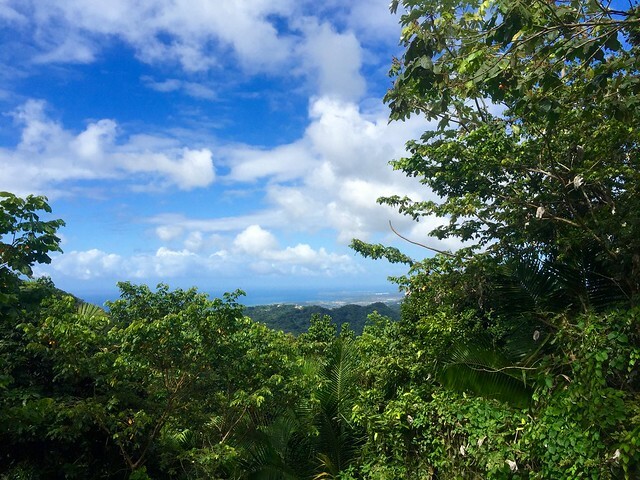 The Visitor Center costs $4 per person but its worth the visit before you head in to read about what you’ll see in the forest and even watch the short video (we didn’t) about El Yunque. You can get guided tours through the visitor center as well and there is a gift shop and cafe. 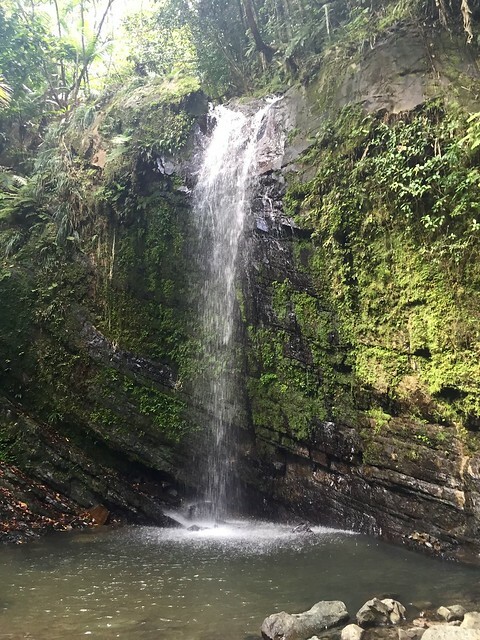 Our next venture will be to find the pools of Coca Falls and we will forever be looking for the elusive goat-sucker, El Chupacabra. Editor's Note: Jen and I also realized we’d spent some time in other pools together on the other side of the world. Here are photos of us 11 years and a few oceans apart. The left is from when we did our research project in Tahiti in 2004 and the right is us at Mina Falls in 2015!